The FBI has been called in to investigate the identities of the black-clad rioters who violently shut down a speaking event at the University of California at Berkeley last week involving notorious right-wing pundit Milo Yiannopoulos, by throwing a firebomb, violently attacking event attendees, looting a Starbucks, and vandalizing the area. The group, wearing ski masks and all-black attire from head to toe, a tactic known as "black bloc," launched fireworks and molotov cocktails at police, caused an estimated $100,000 in damage to the MLK Student Union, and toppled a mobile light structure, setting its generator on fire. The city estimates that the rioters caused between $400,000 and $500,000 in damage to the area outside the university. Immediately following Reich’s claims, one of the violent rioters, who had severely beaten a man who was attempting to attend the event, was identified as Berkeley employee Ian Dabney Miller. The university employee bragged about his violent assault in detail on Twitter, which he has since deleted. Luckily, screenshots were taken before he removed his social media presence. It was confirmed by multiple news outlets that Miller works in advancement communications for the university. “Miller’s involvement with the protests seems to undercut the narrative that the violent riots were somehow an infiltration by secret right wingers in an otherwise peaceful protest to make the left look bad. Berkeley professor Robert Reich promoted this conspiracy theory, insinuating that Breitbart News, an outlet that Yiannopoulos works for, may have been involved in the riots to smear the protesters,” the Daily Caller wrote of the revelation. On Tuesday, UC Berkeley Chancellor Nicholas Dirks, addressed the issue publicly for the first time, stating that he believes they came from outside the university. Dirks expressed his belief that if they had ordered mass arrests, the violence would have escalated. “We’re a university. We’re not the National Guard,” he added. A militant far-left group called By Any Means Necessary (BAMN) has claimed involvement in the riot, saying that they were one of the “organizers of Berkeley’s shutdown of white neo-fascist Milo Yiannopoulos.” In 2005, the group was identified by the FBI as "thought to be involved in terrorist activities." The group is perhaps best known for a 2016 incident in which they showed up to a rally held by the white-nationalist Traditionalist Workers Party outside the California state capitol building in Sacramento. 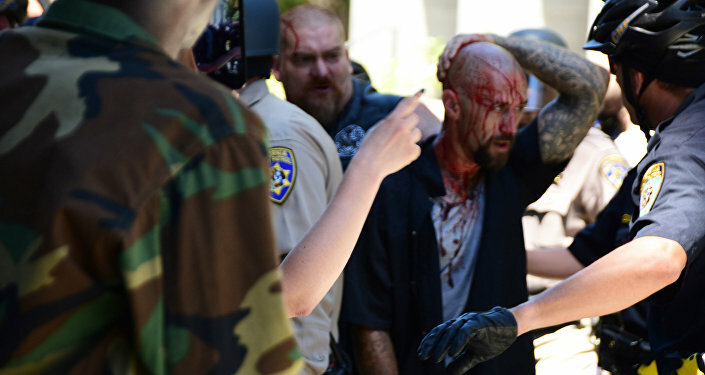 The militant group was confrontational with the white-nationalists within minutes of arrival, and ten people were stabbed and hospitalized in a bloody fight. Police have verified through videos taken by members of the group, news organizations, and bystanders, that BAMN initiated the violence. Black bloc is a common tactic used by far-left anarchists to make it difficult to identify violent protesters for prosecution, by making themselves indistinguishable from one another. While the tactic has been used in various parts of the world for decades, the first recorded use of black bloc tactics in the United States was at the Pentagon in 1988, during a protest calling for the US to stop supporting right-wing death squads in El Salvador. Since then, it has been a common movement at protests across the nation, picking up steam after the Occupy Wall Street protests swept across the country.